The international standard poster size is 24″ x 36″ for a large poster, 18″ x 24″ for a medium, 11″ x 17″ for a small etc. This can be seen in the bus stop advertisements, pin up posters, movie posters, and many other mediums. What we can provide is these consistent sizes that I have personally researched and come across over time including research into size consistencies seen between the world’s largest printing companies. Please read and enjoy, also, bonus: movie poster size. Note: Poster Size is 24″ x 36″ for a large poster, 18″ x 24″ for a medium, 11″ x 17″ for a small etc. 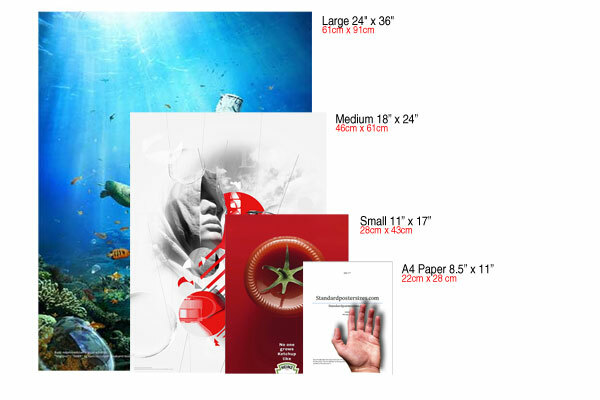 The are different other common poster sizes such as horizontal orientation poster sizes and movie format poster sizes. Another type is halfsheet size which measures 22 inches by 28 and uses a thiker form of paper. This is the smallest standard poster size they are based off of A4 paper size and are great for smaller handouts. They can be used on street posts and other ares though a larger size would be recommended for that. This is a smaller standard poster size they are ideal for street lights, bulletin boards, and generally putting up on businesses without taking up too much room and offending. These also work the best with a minimalist approach to text. Big letters big message. A little more information can be displayed on this standard poster size. I would still recommend some minimalism and little text. These posters are mainly seen as small adverts on university residence floors, doctor’s offices, construction walkways and bulletin boards. – Special occasions, birthdays, etc. This is one of the most common standard poster size (Super A1). These posters are used for most applications including outside of events, trade shows, and malls. Also widely used for small movie posters delivered to fans and posters for decoration like in University residences and outside a pub or club. 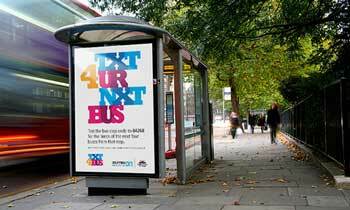 With these types of posters you will be grabbing attention with a large message and you can include further details in small writing so after the message is received people can choose whether to come closer and learn more. Movie poster size has enjoyed some of the most consistent standards within the industry and have benefited from collectors and the film industry’s standardization. This is the most common size for movies used for advertising movies, collectors, and sometimes basement decoration. This is the largest movie standard poster size before moving on to custom sizes they are most commonly used for bus stops. So you have chosen your size and now you want to create your poster. Whats your next step? Well you have three options. 1. 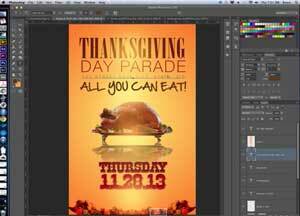 Create your own poster in a graphics editing suite like photoshop. 2. Hire someone else to create your poster. 3. Choose an already created design. 1. Creating your own poster. This is one of the more fun options however be careful many people may think that it is easy to replicate a poster however once they start they find it can be very difficult. There are many things to consider such as; Font, alignment, text kerning, text placement, colors. A great rule of thumb is not to fill up the poster with too much text. Too much text can distract from the original message. Some viewers will only have an average of 2 seconds to grab the message of the poster and keep them engaged so a title that pops out is essential. A very common font that beginners can use is Helvetica, there is a free version out called Coolvetica that can be downloaded and if Photoshop is out of your price range, we recommend you pick up a copy of GIMP which is a free photo editing software that duplicates much of the functionality of Photoshop for free. If you do have Photoshop we recommend you head over to our Photoshop guide section to set up your work-space for design. 2. Hire a designer to create your poster. So your over your head and don’t know what to do even the words “text alignment” scare you. Well this ones for you champ! Hiring someone can be very rewarding especially if you have found a good designer. You can contact a local designer you know/works near you or you can find a designer online. A great site for finding designers is Elance and Freelancer. Both these sites allow you to post a project and take bids. Its important to ask each designer for their portfolios when accepting bids to make sure they are up to the task and make sure the designer uses approved standard poster sizes and templates to make sure your printer has no issues printing out the final design. 3. Use an existing design. Its become very popular these days to find old posters off the web and just send them to print. If you don’t require something customized you can reuse an old design. The only possible problem with this is copyrighting. Make sure the poster or design you are using is not something that is copyrighted. If you are using it for home use such as printing out a celebrity poster. There is no worry. But once you start using it for commercial use. You definitely want to keep your work original to avoid using someone else’s design and a possible lawsuit. So you have your s and you have your design now you want to print. You thought it would be easy from here, didn’t you? Well there are actually a lot considerations you might want to take into account before choosing a printing company. Do you want to print, online, or do you want to print off line at a business near you? Online printing offers many advantages in this day and age with the affordability of delivery, online printers such as Vista Print have had the ability to lower their overhead costs and allow them to edge out local competitors with their low costs. However, a lot of the reviews of some of these online printers have been very low and a lot of people have had problems with delivery and products coming out in a poorer quality than they would have liked. 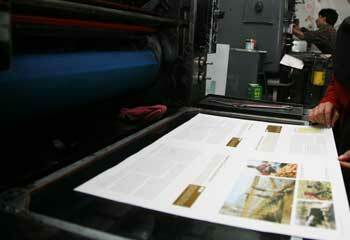 A large issue is not being to accurately see your printing until its too late. The benefit to offline printing includes the fact that you are dealing directly with a real person and you can ask for a test copy of your printed work immediately. A lot of the times because of this higher availability of customer service you get the exact product you want in a timely manner. Most people prefer this additional customer service and are willing to eat any extra cost a smaller local printer could have. The next considerations go to the quality of the company itself. 1. 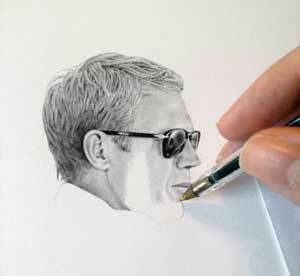 You need to make sure that the quality of the work from the printer is very professional and detailed. You can ask to see different samples of the printers work and make sure that all the colours and alignments are to your satisfaction. Avoid the temptation to simply go for the cheapest printer your customer or viewer will notice and you don’t want to cheapen your brand. 2. 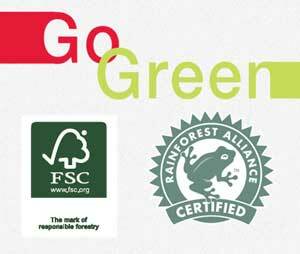 Are green credentials important to you or your customer? In a perfect world they would be important to everyone, but if they are important to you. Make sure that you can see the carbon footprint and that the company has Forest Stewardess Council and Programme for Endorsement of Forest’s certification. 3. Make sure you you’re getting a high level of service. You can check the premises and get a good feel of the workers there and make sure the factory is clean and efficient. The best printers can offer you all the services you need under one roof, and it is definitely more efficient to get all of your services including printing, mailing, and distributing done with one supplier if possible. Dont forget that they use the correct bleeds and provide you with their standard poster sizes since these may vary slightly for company to company. 4. Checking the reputation of the company by using different online recommendations or testimonials or other examples of their work from previous clients can go a long way. You can ask the company how long they have been working and who are their biggest clients to get a general sense. Generally, the larger the project and the larger the need, the more research you may have to do into the company, you will be using.